I never could beat my Dad at chess. Maybe my crying and giving up had a lot to do with it. Last Sunday, Adi played chess with my Dad. Grandpa agreed but imposed one condition: "No crying!" I watched Adi as he went through game after game. He was happy about being able to play longer games and not getting checkmated right away. 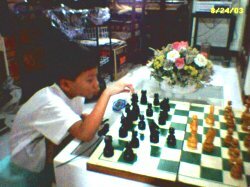 I admired the calm way he looked at the chessboard, a far cry from my nailbiting, 10 minutes per move playing style of several decades ago.